One of ASCE’s most referenced standards is getting an update, and civil engineers are invited to contribute. 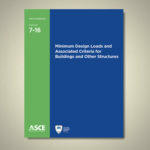 ASCE 7 outlines the minimum design loads for buildings and other structures. After updates in 1999, 2002, 2005, and 2010, it is now in a six-year renewal cycle. The ASCE 7 main committee and subcommittees are helming the update effort, scheduled for completion in 2016. Two packages, dealing specifically with general structural requirements, dead and live loads, flood loads, tsunami loads, atmospheric icing loads, and load combinations, are set to be released for public comment later this month. The general public – ASCE members and nonmembers alike – can submit comments on the revised standard during the 45-day public comment period. The committee will then take the comments into account when it develops the next drafts of each package. Three more packages will follow these initial two later in the year. Comments are collected through an electronic submission system. Those interested in receiving the ASCE 7 packages for comment in September should email James Neckel of ASCE Codes and Standards at jneckel@asce.org or call him at 703-295-6176.